Use a flavorful rich chicken bone broth to complement the nettle and you have a luscious soup. With just a bit of seasoning, you could stop there or you could go for a richer soup experience by adding heavy cream. Cream and green make a perfect marriage. The cream mellows the green and brings out a bit of sweetness. If you are going to enjoy this soup, you will probably have to collect your own nettle. It’s rare to ever find nettle for sale, even in the farmers’ markets. 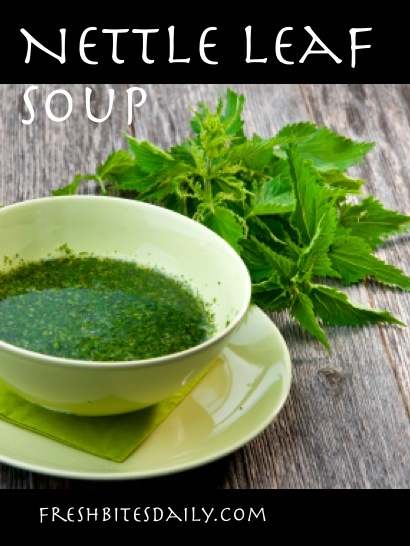 What are the benefits of nettle soup (Urtica dioica)? It is also simply a mild and delicious green that is often available in your own backyard, for free! 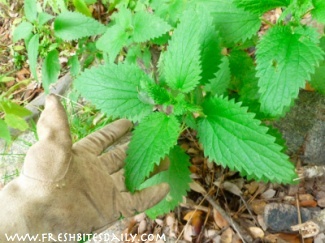 How do you pick your own stinging nettle? Look in damp places. Nettle is a big drinker. Wear leather gloves and bring clippers. Have little, if any, direct contact with the nettles. If you get stung, look for some lamb’s quarters to crush into a poultice. Apply the poultice to your stinging places. 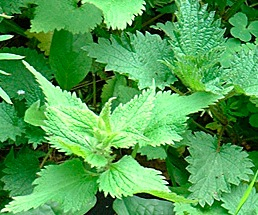 When possible, collect nettle that has not yet bloomed. It is milder than the blooming nettle. Clip the tops of the plant. Do not pull it. The plant will continue to grow and provide a number of harvests, depending on your climate. If you happen on the mother lode of a nettle stand, plan to freeze nettle leaves for soups through the year. The recipe that follows is a starting point — change it to suit your own tastes. 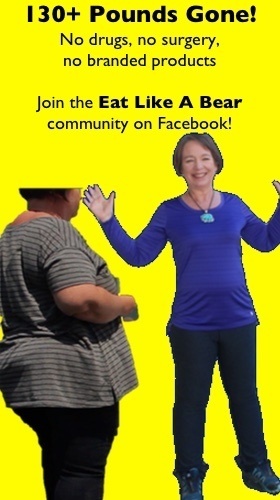 You may like more or less greens. We have made soup so dense with greens that the greens were the thickening as well as the flavor. That’s a lot of green! It is also a lot of nutrition. Eat a green soup like this for a few days in a row and you will experience a fine boost in energy and sense of well-being. Are you persuaded? Here’s how to do it. Heat the broth to a simmer in a large soup pot. While the broth is heating, saute the onion and garlic in the oil using a medium skillet. When the broth comes to a simmer, add the sauteed vegetables and the nettle leaves. Gently stir the soup for about two minutes. Turn off the heat and allow the soup to rest for 10 minutes before serving it. Taste for salt and pepper. Make necessary adjustments. If you want a cream soup, mix the thickener with the cream and beat it with a whisk to break down any lumps. Bring the soup back to a simmer and slowly stir in the thickening mixture. If the soup is too thick, add more broth or water. This soup freezes well if not a cream version. The texture of cream can get weird when frozen. 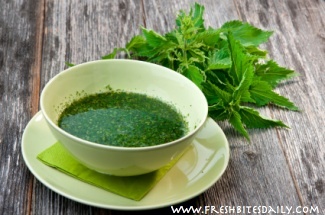 1 Comment on "A stinging nettle soup, full of so much flavor and health, it has changed our lives…"